There is absolutely no reason why anyone should pay the ridiculous prices that cable companies are charging these days. Cable can cost a family well over a hundred dollars a month. Don’t do it! There are so many services available for ten bucks and under that will keep you up to date with all of your favorite shows. Almost every home has a gaming system capable of running these programs. Grab an account with Hulu or Netflix. You won’t run out of things to watch, and you probably won’t even miss your cable. Become a part of your neighborhood network. Friends are very resourceful. Start a borrow or rental program within your neighborhood. Members of the community can share their tools and mowers and such things. It will help everyone save money. One person owns the lawn mower. One person owns the weed eater, and you switch out devices. Just make sure you’re in the type of neighborhood that people can be trusted with such things. Shop wisely. Don’t go to the grocery store every day, and buy one night’s worth of food. That’s the best way to lose money. Shop weekly or bi-weekly if you can. Gather coupons during the week, and plan out your shopping list on a budget. Don’t go shopping when you’re hungry either. It may sound weird, but it really will affect the outcome of your bill in the end. Shop for planned meals however many nights a week you sit down for dinner. Buy your paper supplies and cleaning supplies in bulk. Not only will this save you money, but it will save you from having to take so many trips to the store each month. Toilet paper, dishwasher tablets, hand soap, shampoo, conditioner… these are all things you will save money on if you buy them in the bulk sizes. It would be profitable to seek out a membership to a club like Sam’s Club or something similar. Spend your money on quality materials. If you’re a business owner, you know all too well how helpful this could be to your pockets. 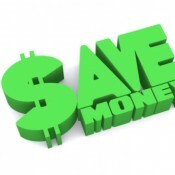 Quality lasts longer, therefore saving you money. If you run a construction company, you would want the strongest materials to run your machines upon. Quality pays off over time.